NGC 922, located about 157 million light years from Earth, was formed by the collision between two galaxies. One of these galaxies is shown in this composite image with X-rays from Chandra (red) and optical data from Hubble (appearing as pink, blue, and yellow). Many of the X-ray sources are stellar-mass black holes that form from the collapse of a massive star. Astronomers are comparing NGC 922 with galaxies of different compositions to learn about how these black holes are created. In this holiday season of home cooking and carefully-honed recipes, some astronomers are asking: what is the best mix of ingredients for stars to make the largest number of plump black holes? They are tackling this problem by studying the number of black holes in galaxies with different compositions. 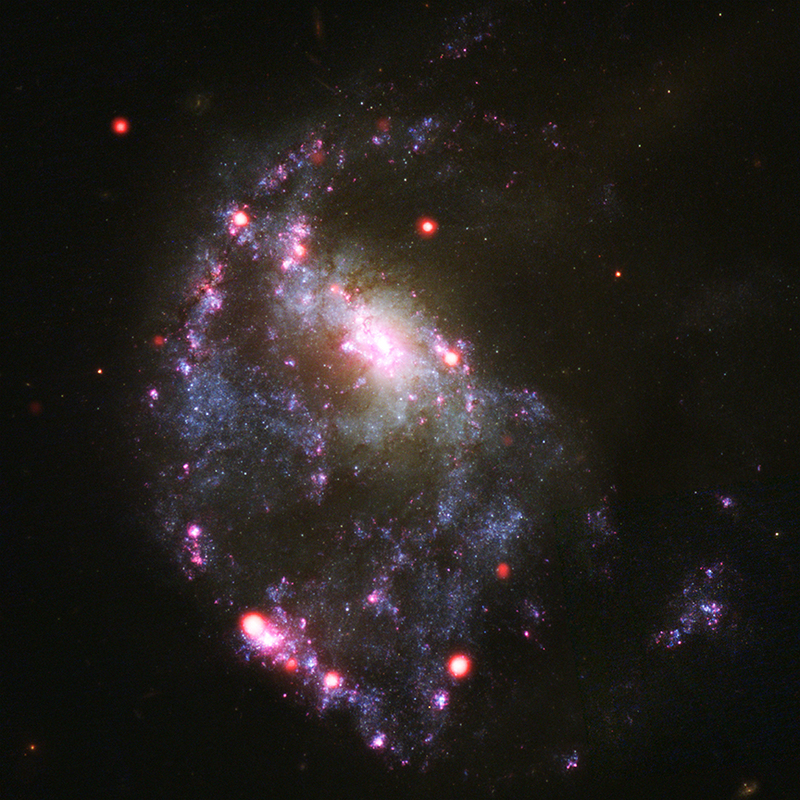 One of these galaxies, the ring galaxy NGC 922, is seen in this composite image containing X-rays from NASA's Chandra X-ray Observatory (red) and optical data from the Hubble Space Telescope (appearing as pink, yellow and blue). NGC 922 was formed by the collision between two galaxies - one seen in this image and another located outside the field of view. This collision triggered the formation of new stars in the shape of a ring. Some of these were massive stars that evolved and collapsed to form black holes. Most of the bright X-ray sources in Chandra's image of NGC 922 are black holes pulling material in from the winds of massive companion stars. Seven of these are what astronomers classify as "ultraluminous X-ray sources" (ULXs). These are thought to contain stellar-mass black holes that are at least ten times more massive than the sun, which places them in the upper range for this class of black hole. They are a different class from the supermassive black holes found at the centers of galaxies, which are millions to billions of times the mass of the sun. Theoretical work suggests that the most massive stellar-mass black holes should form in environments containing a relatively small fraction of elements heavier than hydrogen and helium, called "metals" by astronomers. In massive stars, the processes that drive matter away from the stars in stellar winds work less efficiently if the fraction of metals is smaller. Thus, stars with fewer of these metals among their ingredients should lose less of their mass through winds as they evolve. A consequence of this reduced mass loss is that a larger proportion of massive stars will collapse to form black holes when their nuclear fuel is exhausted. This theory appeared to be supported by the detection of a large number (12) of ULXs in the Cartwheel galaxy, where stars typically contain only about 30% of the metals found in the sun. One explanation for these results is that the theory predicting the most massive stellar-mass black holes should form in metal poor conditions is incorrect. Another explanation is that the metal fraction in the Cartwheel galaxy is not low enough to have a clear effect on the production of unusually massive stellar-mass black holes, and therefore will not cause an enhancement in the number of ULXs. Recent models incorporating the evolution of stars suggest that a clear enhancement in the number of ULXs might only be seen when the metal fraction falls below about 15% of the Sun's value. Astronomers are investigating this possibility by observing galaxies with extremely low metal fractions using Chandra. The number of ULXs is being compared with the number found in galaxies with higher metal content. The results of this work will be published in a future paper. 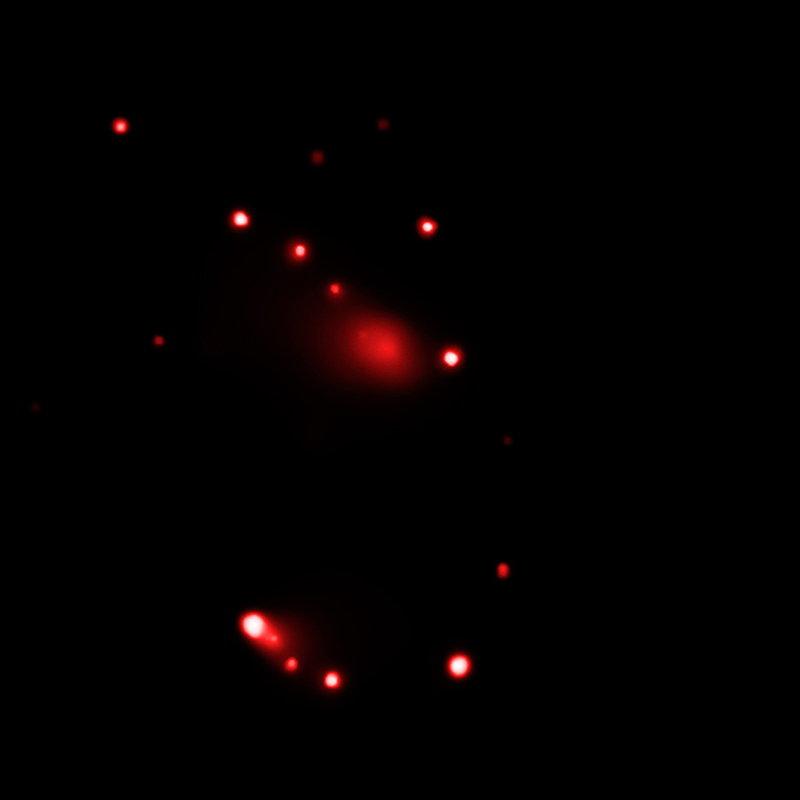 A paper describing the results for NGC 922 was published in the March 10, 2012 issue of the Astrophysical Journal. The authors were Andrea Prestwich and Jose Luis Galache of the Harvard-Smithsonian Center for Astrophysics (CfA) in Cambridge, MA; Tim Linden from University of Santa Cruz in Santa Cruz, CA; Vicky Kalogera from Northwestern University in Evanston, IL; Andreas Zezas from CfA and University of Crete in Crete, Greece; Tim Roberts from University of Durham in Durham, UK; Roy Kilgard from Wesleyan University in Middletown, CT; Anna Wolter and Ginevra Trinchieri from INAF in Milano, Italy. Coordinates (J2000) RA 02h 25m 04.40s | Dec -24° 47´ 17.00"
The ring galaxy NGC 922 was formed by the collision between two galaxies. About 157 million light years from Earth. Combining data from Chandra and optical data from the Hubble Space Telescope. About 73,000 light years across. X-rays are red, optical red, green and blue. In the constellation Fornax visible in the Southern Hemisphere.